You would be forgiven if you think that Chinese can be disgusting when it comes to eating. Truth is food like innards and turtle soup may not sound common among other races but when cooked in the right way, it can be very delicious. While non eaters(like the westerners) would use words like gross, disturbing and exotic, we say fantastic, delicious and sumptuous. Food culture is a result of the history. In China, people used to be very poor and so they would eat everything, from neck to heart to tail. It was a necessity in those days where food is not in abundance. It is a necessity today because it is already part of our culture. 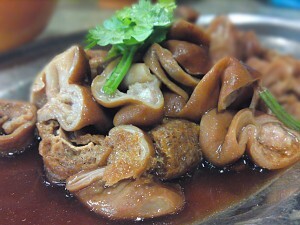 Kway Chap is a relatively simple dish. The only secret( if there is one), lies in how much spice they use to stew the innards. 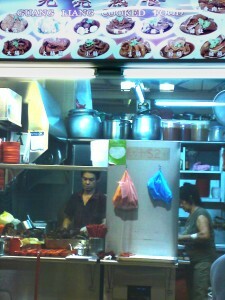 I love to visit this particular stall in Bedok Reservoir because their intestines are tender and looked really clean. And also their soup is not overly spiced with chinese herbs as can be the case with other stalls. We all know what intestines are use for in the body. So I really did not want to eat anything more than what I can see. Some of my friends ask me how can i tell whether is it clean since the soup is also black color? Well intestines usually have a layer of fats along the internal walls and I usually would use my chopsticks to dig into the inside of the intestine to see if it’s still there. If it isn’t there, then it is because the seller had washed it thoroughly. This is the only local dish that when I eat, I wouldn’t want to get more than what I asked for! Conclusion: Definitely one of my favourite to visit since I am only going to Kway Chap stalls for intestines. The soup hasn’t got that strong herby flavour so it’s a plus point for me and so the tao pok is equally good since inside it’s full of that ‘LOR’(gravy). Likes: Intestines and well balanced flavour in the soup. Dislikes: Portion a little small for $3. Kway Chap is one of my fav dish and I am also very particular about it when it comes to ,,, giving more than what I ask for. i usually dont check the intestines but i will be very cautious after taking the first bite to make sure it doesnt taste funny. i noted the address and will check out this stall when i back in Singapore. The salted vegetable is also important in the kway chap cos it “neutralises” the taste and it is a MUST HAVE dish. I do like Kway Chap as well. I will usually order the salted vege (Chai Buey), egg, fish cake and pork/duck. I can do without the innards. jasmine : like that not authentic leh. 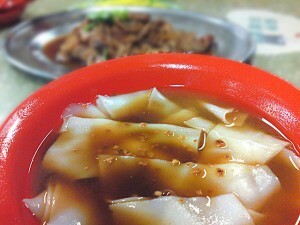 eat kway chap without the innards is like eating chicken rice without the chicken. Yes nowadays a lot of kway chap stalls are also selling soya duck too. Sometimes it’s good to go with duck in kway chap, the most important thing is chili, the more sour the better! Went to try this Blk 630 kuih chap after TV8 recommendation. Nothing special but wasted almost 2.5 hours of waiting, actually we went there for breakfast but turned out to be for lunch ! everyone should give bedok north street 3 blk 531 kway chap a try.. nice and cheap.. kind aunty..
is locate at a coffee shop.. last time was at bedok 538 market.. now move to coffeeshop due to market rental..